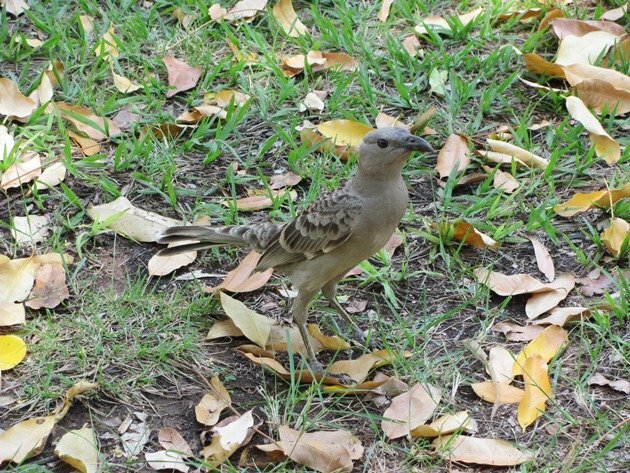 One of the most intriguing birds around Broome is the Great Bowerbird. We often see them flying from place to place collecting items for their bowers and they are rather clever at imitating other birds vocal sounds. When they are not imitating they tend to make a screech sound, which is rather rasping and does not sound particularly birdlike. They visit our garden for water, but we have not noticed them removing anything for their bowers. The bower is built by male birds to attract a female and they use the same area for numerous years, but not the same bower. Recently we came across two bowers side by side in Minyirr Park, which was unusual. We had only ever seen one before in that area and we returned ten days later to see any further developments. We were surprised to discover that there was now only one bower and all of the “treasures” had been moved across to one and most of the sticks had also been moved across and reinforced the bowers sides and closed in the roof. A week later there was very little evidence of the second bower and the current bower is overflowing with “treasures”. It would have been incredible to film the process over the previous two weeks of moving items and dismantling and reinforcing the bower. In a period of a week it had filled up the inside of the bower with a collection of brand new shiny tech screws. 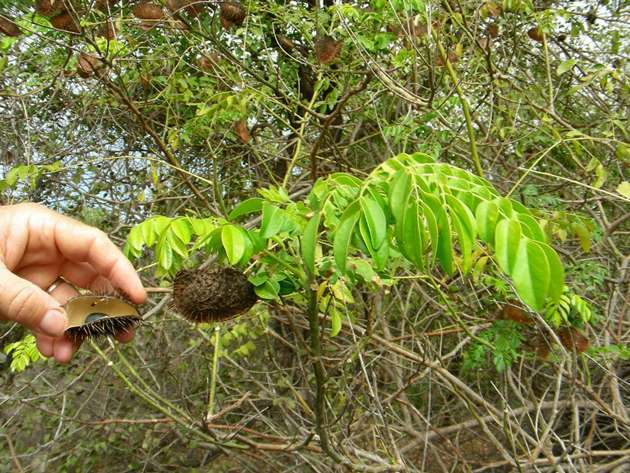 The bower is under a Nickernut tree, which provides an ample supply of green seeds in a spikey casing and they remove the nuts from the bower once they are no longer green. 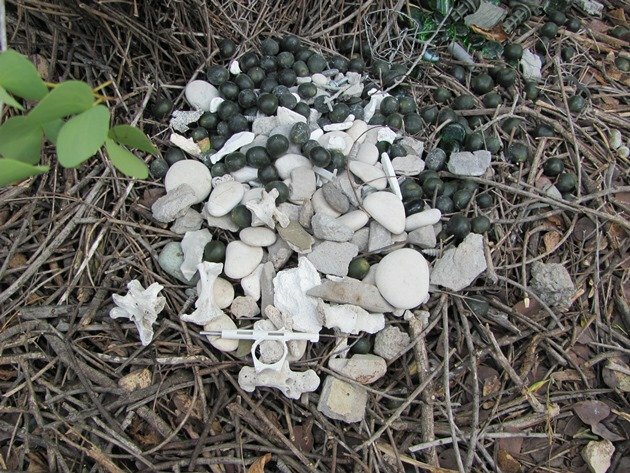 This male Great Bowerbird likes to collect the usual items that are green and white, but due to its closeness to human habitation it is able to collect a variety of items beyond the usual Nickernuts, bones, rocks and shells. The white tool is used for adjusting your reticulation. Due to houses being built in the area it had managed to collect a nice supply of tech screws, nails and washers. To the edge it has a collection of green glass, which is being kept separate from the other items. 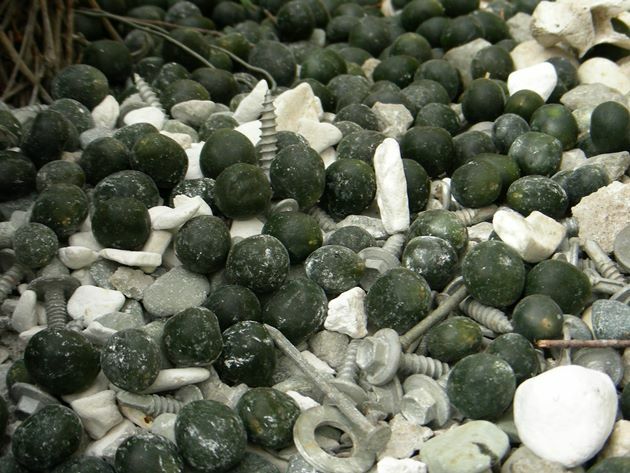 There are glass bottle ends, glass beads and glass marbles. There is also a champagne bottle top metal surround and some aluminium foil. 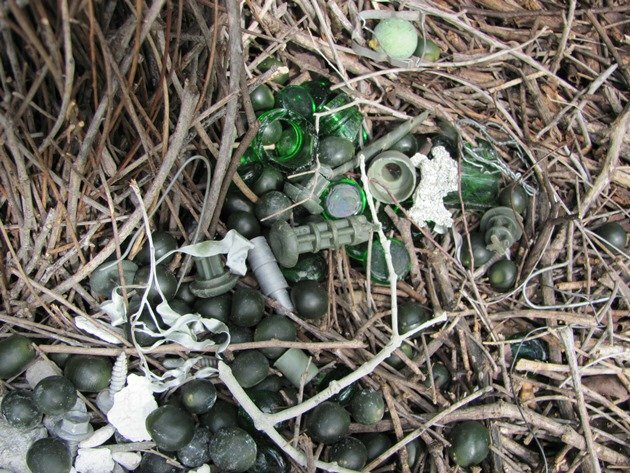 A variety of green plastic items are also kept in this area of the bower. 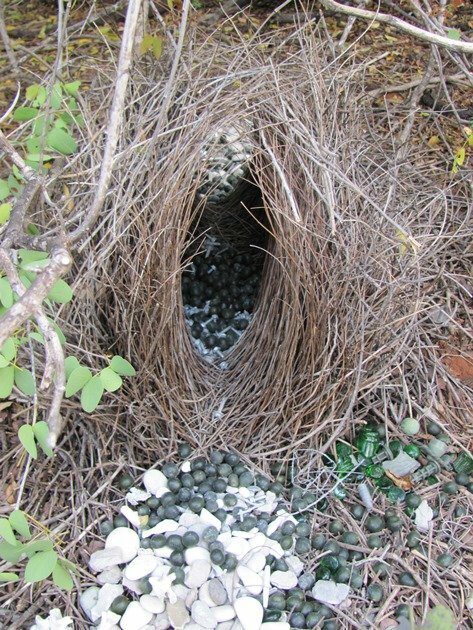 The male Great Bowerbird is constantly rearranging its bower and trying to improve its chances of attracting a mate. 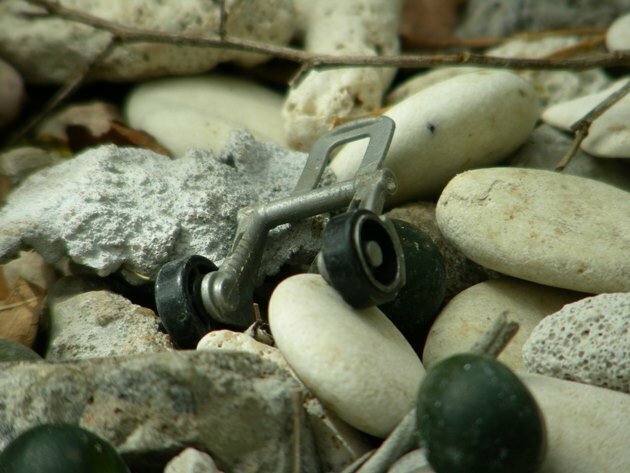 One of the funniest items we have seen at this bower over the years is a set of wheels! The item is no longer there, so it must have become out of favour, but it is worth showing you all….. If you discover a bower in an area far from human habitation the items in the bower will differ greatly as we discovered at Lake Argyle last year. 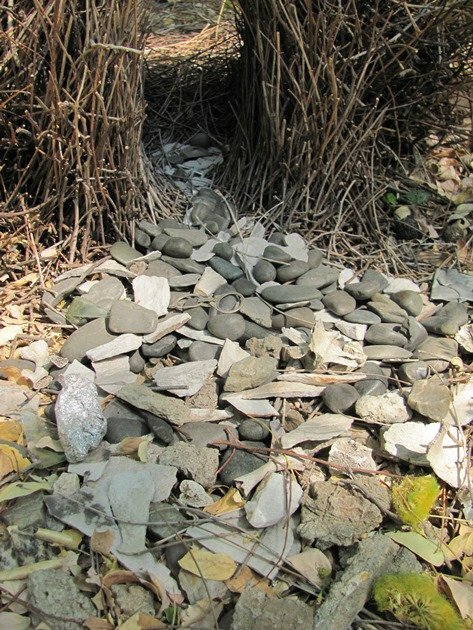 The bower consisted mainly of rocks from the surrounding area with the exception being a ring-pull and some aluminium foil. It was within close proximity to a barbeque area, which explained the unnatural items within it. The discovery of a bower is always a rewarding experience and once you have established the location of a bower it would appear you can watch the building and dismantling of bowers in the same area for many years to come. 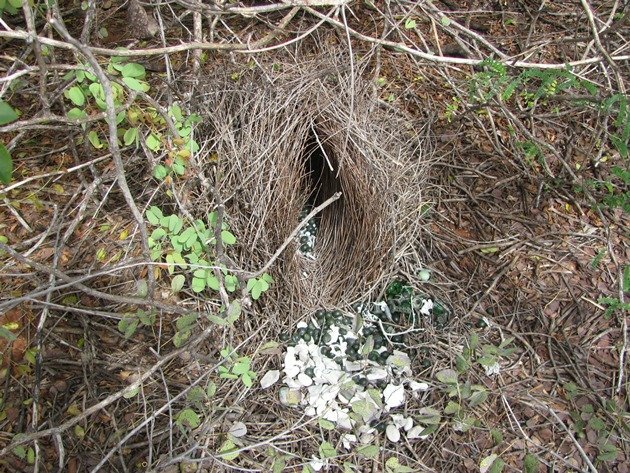 It would be interesting to know how far the Great Bowerbirds are prepared to travel in their search of “treasures”, but I would suggest they may do several trips back and forth to one area once they have established a worthwhile supply of “treasures”. Where the Birds Are (and Why); Plus, Who Would Steal a Young Birder’s Make-a-Wish Gift?